BrahMos Aerospace chief Sivathanu Pillai emphasised the great efforts from the Indian and Russian scientific communities to bring about a world-class missile system. Source: Alessandro Belli. Russian Deputy Prime Minister of Russia Dmitry Rogozin presented the prestigious “Order of Friendship” award to Sivathanu Pillai, BrahMos Aerospace chief at the Embassy of Russia in New Delhi. This state decoration of the Russian Federation established by presidential decree 442 of March 2, 1994 was conferred upon Pillai by the President Vladimir Putin, for his great contribution to the strengthening of friendship and cooperation between India and Russia. 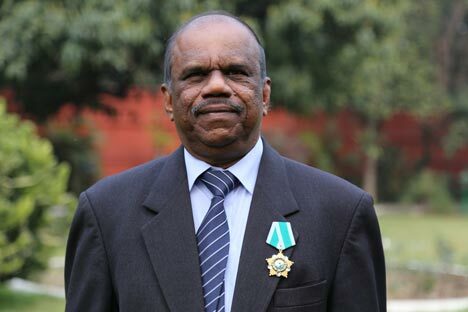 “I have the honour to decorate Dr. Pillai with ‘Order of Friendship’ award signed by the President of Russian Federation H.E. Vladimir Putin for his great effort invested in this large scale work in the science & industry for the benefit of both India and Russia,” Rogozin said. Pillai also highlighted the enormous efforts from the Indian and Russian scientific communities to bring about a world-class missile system, while thanking the Russian Government for the trust bestowed on the joint venture. He added that the BrahMos is an important bilateral project and scientists from both countries put in a lot of effort to make it successful. “But our friendship goes beyond that. It will strengthen and develop in future, and we'll do everything possible for that,” he said. BrahMos cruise missiles have been adopted by India's Army and the Navy’s surface ships. The Indian Air Force has also ordered a batch of land-based missiles. Work is also underway to adapt the missile to Su-30MKI planes used by the Indian Air Force. BrahMos is an acronym of the two rivers: Brahmaputra in India and Moskva in Russia. Earlier this month, on the sidelines of Defexpo-2014, Pillai told RIR that BrahMos was looking to make missiles adaptable for the fight generation fighter aircrafts being developed by Russia and India. “That type of aircraft is going to produced in large numbers both in India and Russia. Why not we make a missile suitable to be carried by the fifth generation aircraft? This we want to show,” Pillai said.